How Much Does Laminate Countertop Installation Cost? The typical kitchen in American households is sized at about 250 square feet and is comprised of about 30 linear feet of countertops and cabinets. This makes it relatively easier to understand the average cost to install a laminate countertop. The important thing to consider before beginning the laminate countertop installation is what it will have to withstand on a daily basis. For example, burns, scratches, and nicks are some of the things that your kitchen countertop will have to endure. Ultimately, laminate countertops are durable, stylish and relatively inexpensive. How Much Does It Cost To Install a Laminate Countertop? Most home service companies charge about $35 per hour and can do the laminate countertop installation in a day for eight labor hours so you can expect to spend $250 or thereabouts on labor only. Depending on the laminate you want for your countertops, you can pay from $20 per square foot up to $40 per square foot. When choosing the material to use, you should bear in mind that cheap can sometimes be more expensive. Choosing the more inexpensive option might force you to do another installation sooner than you expected. Kitchen renovation often requires new countertops to be installed. Unless you are an experience carpenter, we recommend leaving laminate countertop installation to the pros. Compare quotes for a fair price and quality guaranteed work. Most laminate countertops that you are going to find are already pre-fabricated, that is, they have been prepared and cut before coming to your home for the actual installation. If you decide to go with laminate countertops that need to be prepared and cut at your kitchen site, your installation costs could significantly rise. You may get a discount from your contractor if you remodel your entire kitchen in addition to your countertops. If your kitchen’s laminate countertop installation is going to include the removal and disposal of your old countertops, then be prepared to add some more money to the total installation cost. If you are looking to add a sink to your countertops, your installation cost is going to be slightly higher. The same applies to adding end caps and backsplash. You may have to add about $300 to your installation costs for these improvements. What’s The Average Cost To Install a Laminate Countertop? Depending on the area that’s going to have the laminate countertop installation, you might spend from as little as $400 to as much as $2000 especially if you are having enhancements and improvements being done in addition to the laminate countertop installation. The average cost to install a laminate countertop, however, is about $1000. Before you go out shopping for laminate countertops, you should first measure your countertop area. Most Home service stores will provide you with a worksheet to help you calculate your countertop measurements, including all corners and allowances for sinks. A professional installer will later do the proper sizing when doing the laminate countertop installation. Doing the measuring yourself is so that you can get a rough estimate of how much it’s going to cost you. To save up on time, view the color palates of laminate countertops from different manufacturers’ websites. Choose the color that you love most and the texture you envision for your kitchen. Remember, the countertops are the focal point of your kitchen. 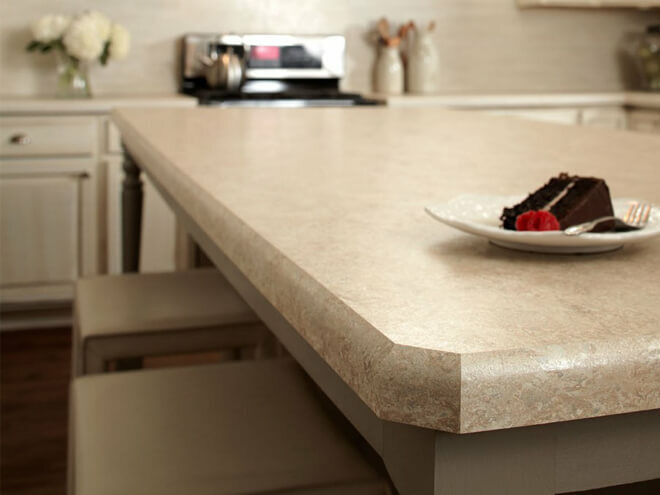 Because laminate countertop installation costs vary widely by region. It's best to get estimates from pros in your local vicinity. Simply enter your zip code in the space provided. Remember it’s 100 % FREE and without obligation! Compare quotes and schedule an appointment before you agree to the terms of your laminate countertop installation.